The Rydon sustainable bikelight is permanently mounted on your bicycle so you can never forget it. One of the smart features is the integrated solar panel, which will convert every beam of sunlight into energy and stores it in the batteries, so you will never have to replace and dispose the batteries. The Rydon uses the sunlight during the day to charge the batteries for the evening. The Rydon is made of high quality materials to make sure you enjoy your bicycle light for years instead of months. Follow the link to the RYDON website for more information on how to install and operate the Rydon. 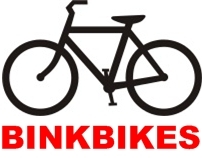 At BINKBIKES atelier we always have Rydon’s in stock.